CentrikBlogsLegal AdvisoryAuthentic Legal AdviceRERA or IBC-Under which law Homebuyers are well protected? Both of the enactments have been laid down with the different agenda. Real Estate Regulatory Authority (RERA) was enacted for the utmost protection of the rights of the Homebuyers and to safeguard the hard earned money paid in lieu of the expectations of getting a home in return whereas the Insolvency and Bankruptcy code, 2016 was enacted to revive the company if possible and to safeguard the interest and money of all the creditors (Financial and operational creditors) of the company. When a Homebuyer does qualify to file a petition under the IBC? That the default arises on the part of Corporate Debtor/ Developer’s Company. Now, whenever the Homebuyer wishes to file an insolvency petition under IBC both of the essentials should exist at the time of filing the petition. For a home buyer to commence proceedings under the IBC as a financial creditor there should be a default in relation to his financial debt. “Default” is defined to mean the non-payment of the debt when whole or any part or installment of the amount of debt has become due and payable and is not repaid by the debtor or corporate debtor, as the case may be wherein the relief asked for will be resolution of the company and if the resolution of the company is not all possible then the liquidation of the same corporate debtor or company will take place and the Homebuyer will be provided the debt amount only when his turn will arrive as per the waterfall mechanism under section 53 of the IBC. 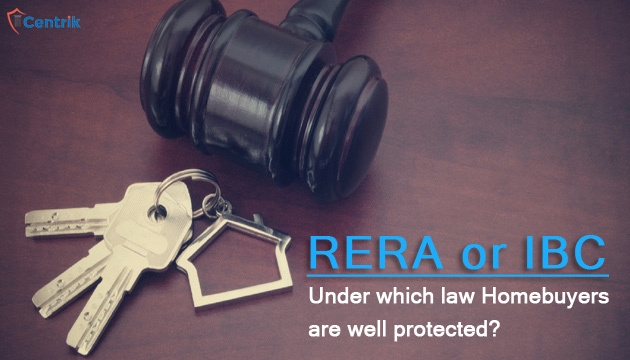 While a complaint under the RERA is made out when there is default on the part of the developer in delivering the possession of the Flat or any unit within the agreed time period wherein the Homebuyer will cancel the agreement and subsequently will seek for the possession of the unit or refund of the amount paid along with the interest upon the amount paid or any advance made therein. Now the major question which arises is out of both of the acts which one is better and provides with a better relief. Although now both of them provides recognition to the homebuyers and protects the interest of Homebuyers but in a different way but it is pertinent to understand the purposes of both the acts and the relief they provide as both have a different approach to get the relief. Although the IBC amendment was brought to emplace the homebuyers in the IBC with the motive to protect and acknowledge the right of homebuyers in case the Insolvency Petition is filed against the Developer’s Company but RERA being a more specific act should be adopted when the construction of the project is at the urge of completion or when it is possible to get the refund or possession from the developer. Therefore, both the laws provides with the subjective approach depending upon the facts of the case and the situation of the developer.